The Demarcke family gathered on Sunday, August 11, 2013, for a reunion in Île-des-Chênes, Manitoba, where they celebrated the 100 year anniversary of the arrival of Hector, Marie, Anna and Leopold Demarcke to Canada. More than 200 family members from across the country were in attendance. In addition, a number of family members travelled from the U.S. to attend the reunion. Hector Aloise and Marie Louise Demarcke immigrated to Canada from Geluwe, Belgium in 1913. Their two young children, Anna (3 yrs.) and Leopold (18 months), accompanied them on the voyage across the Atlantic Ocean. Hector arrived in Halifax, Nova Scotia aboard the S. S. Noordam, on May 5th, 1913. Marie, Anna and Leopold set out for Canada three months later, arriving at the Port of Quebec on August 16th, aboard the R.M.S. Royal George. The family settled in St. Boniface, Manitoba. Within a few years, they moved to their dairy farm in Lorette West. The Demarcke family would grow to include nine children. Hector passed away on March 20, 1930, at the age of forty-nine years. Marie passed away on August 3, 1959, at the age of seventy-three years. A video was produced as a result of the meeting. Some images for the video came from the Centre du patrimoine archives. They appear early in the video, between the 38 second and the 6:05 mark.. If the Vimeo video does not play smoothly, it may help to allow it to buffer completely, before watching. The video is 60 minutes. It may take 4-5 minutes to buffer, depending on your computer and Internet connection. To watch the video from the beginning of a particular segment, click on “Read More ...” at the bottom of the info about Hector & Marie Demarcke. Then, you can click on the times listed next to the segment titles. If you have a problem watching on the Vimeo website, you can also view it on the Photodex site. You need to use a Windows computer to watch. It won’t play on a Mac. Unless you already have their Presenter plugin installed, you will be prompted to install it. It’s safe and can be uninstalled later, if you like. Providing you are using a newer computer, the plugin will play the video more smoothly than the Vimeo website. We thank Vic Bergman for providing us with the above information. In the La Liberté numérisée, you can access pages refering to the Demarcke family. 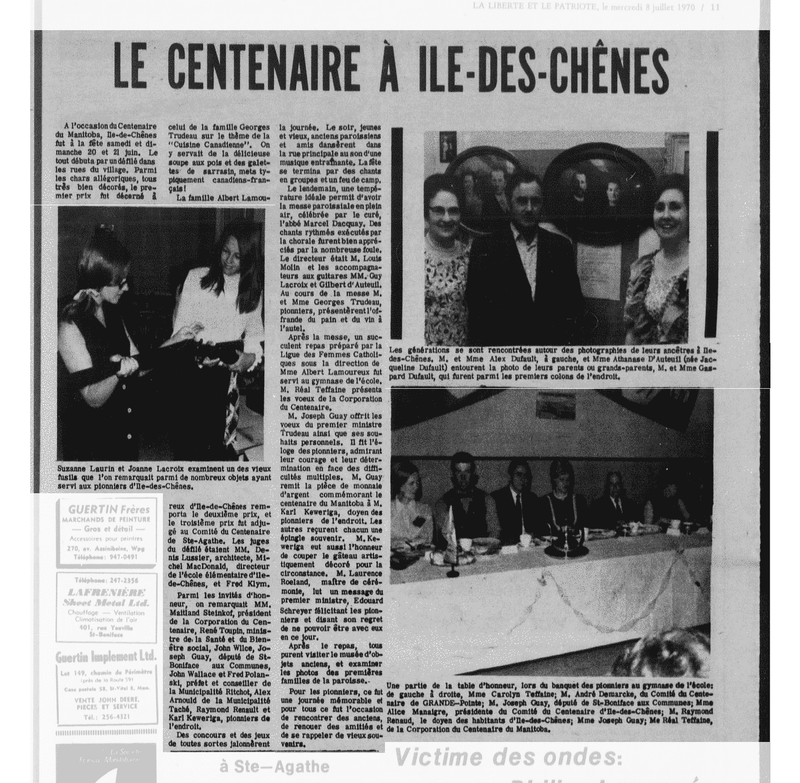 For example, in La Liberté et le Patriote du 8 juillet 1970, page 11, mention is made of André Demarcke who is sitting at the table of honour at the centenary banquet in île-des-Chênes.